Whether you’re moving in Washington DC from Adams Morgan to Capitol Hill, Chinatown to Logan Circle, Woodley Park to the West End or beyond the Metro area, My Guys Moving & Storage is the DC moving company to call! 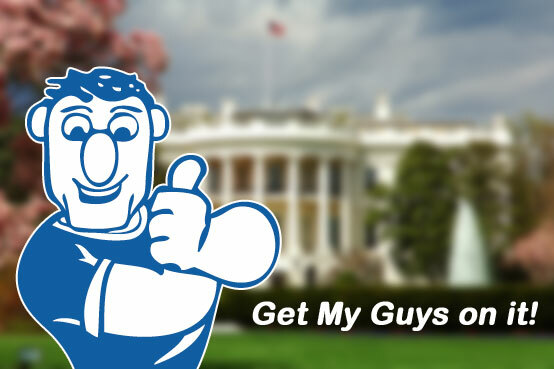 My Guys Moving is the premier moving company in the District of Columbia with a long-standing history in the region. We are fast, affordable, dependable DC movers. With more than 20 years of moving experience and thousands of happy customers, we have the expertise to make your moving day a piece of cake. It doesn't matter whether you're moving locally or long distance - Get My Guys on it! Call 202-223-8838 or simply fill out a request for a free moving quote. We are both residential and commercial movers specializing in the areas in and around the nation’s capital. Our clients agree that we know the city inside and out. Washington, DC is known for having buildings with strict access codes and limited access times. My Guys Moving accommodates these schedules and has moved countless families under these restrictions. Our team also has experience moving Fortune 500 companies into and out of the District and has worked with military personnel at high-security bases. For long-distance moves, this will entail a visit from a relocation specialist, who will perform a no-obligation visual survey of your property and then provide a more accurate estimate. Get the Best DC Movers! Once you’ve decided on My Guys Moving, we require a security deposit for customers to reserve the date and time of their move. For your convenience, we accept all major forms of payment including Visa, MasterCard, AMEX and Discover. On moving day, our rates begin when the movers arrive at your loading location and continue until work is completed at your destination. Please note that this does include any time spent traveling between locations. In some cases it might take longer to get to your destination if we have to navigate busy city traffic. A move from Glover Park to Georgetown for example is likely to take far less time than a move from Chevy Chase to Shaw. We will drive as quickly and efficiently as possible while respecting the safety of our team and following the rules of the road. We charge our clients an hourly move rate, plus travel time but there are no extra fees or extraneous charges. Pricing may vary depending on the day and time you choose to move, so we recommend that those who are on a tight budget consider a mid-week or mid-month date when demand is lower. As a general rule, you can expect your move to take about an hour to an hour and a half per fully-furnished room. The total time can vary due to unforeseen circumstances. For example: if the loading or drop-off location has an elevator, multiple flights of stairs, or a significant walking distance from the vehicle to the front door. “I scheduled My Guys to move my belongings from DC to VA on Friday 27th and I know I did not make a mistake. The 4 Guys who came, were just very efficient, fast and very responsive to every detail, not only to wrap and put everything in order but they traveled and unloaded, reinstalled the furniture at record pace. With my family, we are very happy and much pleased with each of the four guys who came to do the move. They were very respective and willing to do anything and beyond. I wish there were people in every stage of life who would be efficient as these 4 Guys you sent, boy there would be no unhappiness in this world. Not all moving companies in DC offer value liability coverage, but as a professional moving company in DC, My Guys Moving & Storage provides limited valuation coverage at sixty cents per pound, per article, up to a maximum of fifty dollars at no additional cost if an accident occurs on a local move. You can also invest in a full value protection plan if you want the additional peace of mind to safeguard your shipment even further. Read more about Valuation Coverage or contact us at 202-223-8838 to learn more. If you’re prepping for a move, finding boxes and prepping supplies is often the most frustrating part. So, for your moving convenience, My Guys offers a full line of packing supplies and materials for purchase prior to moving day. From specialty boxes to tape to packing paper, we offer a wide array of options. For local moves, you can get free delivery for orders over $100. One customer favorite for DC moves is the “wardrobe carton”, a portable closet that lets customers hang 18"-24" of clothes from a bar to prevent wrinkles and speed up the packing process. This container is useful for those who need easy access to clothing and don’t want to dig through boxes when they reach their destination. When it comes time for your move to or from Washington, DC, you can trust My Guys Moving to think of every last detail. “I was VERY impressed with them. George came for the in-home consultation. He was kind, professional and willing to go back and forth to look at our storage cage, under the beds, over-closet storage etc. to get an accurate quote. I told him I wanted to pack a number of boxes on my own but have them do the "hard stuff" like the kitchen. My Guys half-pack quote came right in line with 2 other estimates - literally all of them were within $300 of each other, so I felt confident he knew what he was doing since they were the ONLY company to come do an in-home estimate. I made the deposit via the phone and away we went! I was impressed with their presentation and follow-up, the examples they gave of buffer the furniture and the floors, etc. and felt like their careful wrapped of items would make a difference for us in the end. Moving day, Tim and his crew (Hector and Louis) showed up. They were right on time, gracious to the front door manager and all set-up with runners and the truck organized by the time I met them. Great! They were super friendly, efficient and professional and I trusted them to do a great job as I watched them handle my items with care. Boxing our items took a little longer than expected (4:00 pm vs. 2:00 pm) but I can't really fault them for taking their time to pack the items correctly - I had some BIG pieces that took a lot to get out of the apartment and in the meantime, Tim fixed a very fragile piece of furniture to make sure it made the move safely. Bonus points there! The crew took MAYBE a 20 minute lunch break - so they were hard at work from 8:00 AM onwards! Tim and crew were very flexible about their arrival time (and brought a 4th unpacker - Deto (sp?) - such a nice group of men!) and came much earlier than expected when we asked. Another plus! They again arrived right on time at our new home and got to work. Unpacking always goes faster so within 3.5 hours the house was unloaded. They were again gracious and cheerful for having been on the road since 4 AM. They were very accommodating when we asked them to move some existing furniture for us to help the rooms get laid out correctly, they adjusted pieces when I realized better spacing was needed, they had runners everywhere and were VERY cautious moving the boxes through the house as I explained the house was freshly painted. Love that attention to detail, My Guys! Call us locally at 202-223-8838 or toll-free at 800-783-4897, or simply fill out the free moving quote and One of the Guys will be right with you. Thanks for contacting MY GUYS! Washington, DC Metro area and beyond the Beltway including Maryland & Virginia.